Sea stars (starfish) are the most common echinoderms on the Reef and they come in all shapes and sizes. As their name suggests, sea stars are commonly recognised as stars and come in many different colours, the most common being yellow, red, orange and pink. Some are entirely one colour while others come in many different colours and each species has a unique design. Sea stars and all other echinoderms have three main characteristics including a symmetrical five-part body plan, tube feet and a skeleton of plates. Sea stars have an amazing water-vascular system, with water-filled tubes ending in numerous finger-like projections (tube feet) that stick out through the skin. Their tube feet are located on the underside of their body on the end of the suckers and are used for movement. The water-vascular system works on water pressure, creating a network of tube feet that look like hundreds of tiny, hydraulically operated legs. A sea star's mouth is also found on the bottom of the body. Most sea stars have five arms with an eye at each end. This eye sees only light and darkness. If one of these arms is lost, another one can be grown back. Some sea stars live on the ocean floor while others live around the coral reefs. Many sea stars are able to reproduce asexually when parts of their bodies break off and grow. In some cases the leg of a sea star will simply 'walk away' from the rest of the body. Some sea stars reproduce by mass spawning. Sea stars feed on a variety of foods ranging form algae and detritus, to living coral polyps. Sea stars don't send food to their stomach, they send their stomach to the food. The sea star sits on top of the food and everts its stomach through its mouth, covering and digesting the food externally. 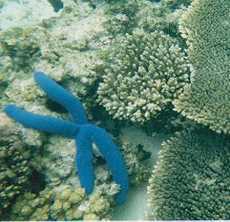 The most commonly encountered sea stars are the cobalt blue, linckia and foten, which are found on most reef flats. potentially grow back into a full sea star.